My daughter is interested in learning how to read so I’m always looking for ways to add words in to our play. She enjoys reading books, but she’s still at the stage where that can feel like hard work sometimes. Adding words into our play gives her lots of opportunities to practice reading but it feels much more like fun than a lesson. 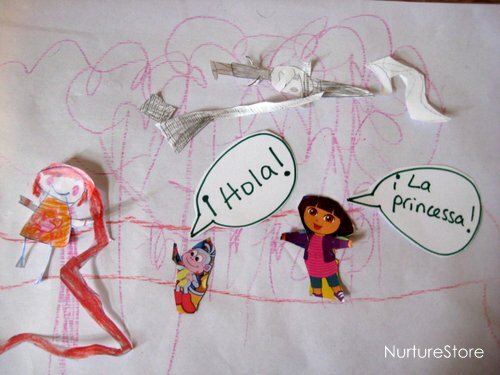 Here’s a very simple but effective way to add in some reading to a story telling and art play time :: we’re using speech bubbles! A new magazine is a big treat! Even better if it features your favourite cartoon characters. 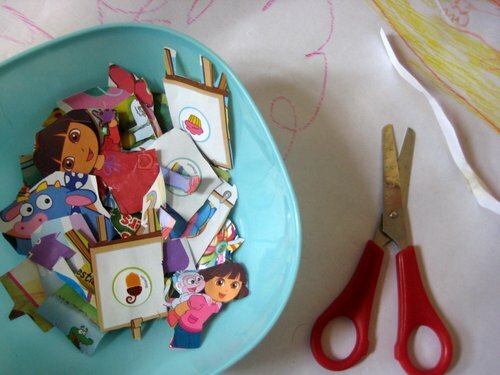 L loves to cut out lots of pictures when she’s finished her magazine and use them to act out her own stories. 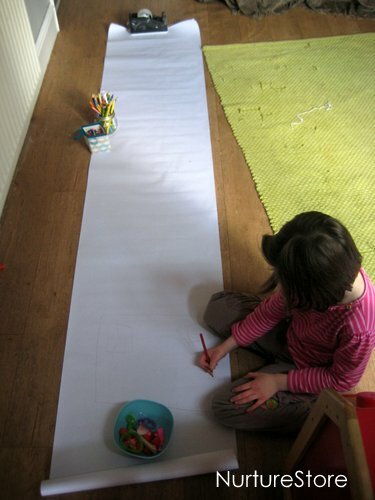 I set out a big roll of paper for her to use as her story board. So nice to have all that space to draw and draw! 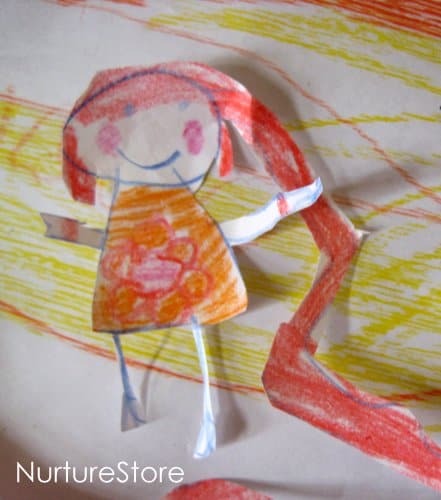 Add in a pot of crayons and she can draw the scenes from her stories and make up some characters of her own. 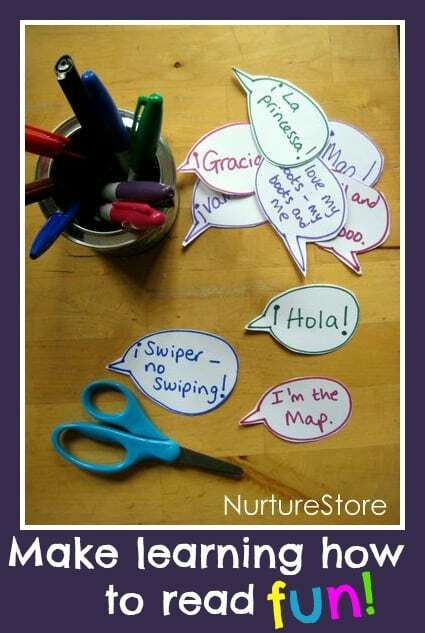 I set down a little pot of speech bubbles – which got big smiles from my story teller when she spotted some fun phrases! – and let her add them in to her pictures. 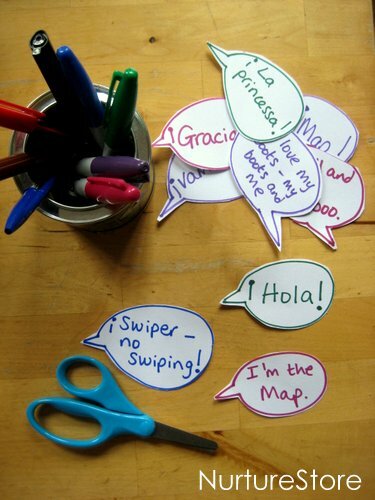 Little and often can work really well when you’re learning how to read, and these speech bubbles compliment the play, give a little burst of reading, without stopping the flow of the play. What an excellent idea. This would be great for my late readers because I could fit it to their interests. Thanks Phyllis. This could for sure be adapted. Hope your boys have fun with it – and hope you are well! Thanks for the pin maryanne! This is a great idea, and well executed! It does introduce reading into play without interrupting the flow at all — in fact it sparks creativity. No wonder your daughter loved it!